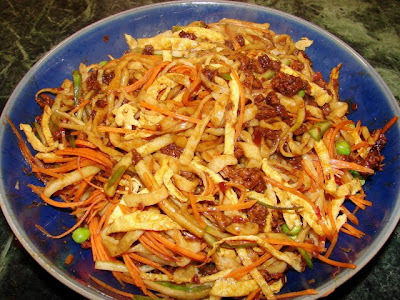 Zha Jiang Mian 炸醬麵 is fried sauce noodles, I called it Chinese spag bog. These noodles are very popular in most parts of Northern China, especially Beijing. 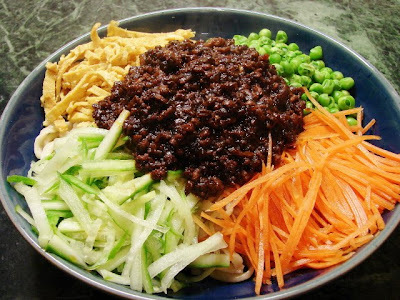 Koreans are also fan of zha jiang noodles, similar name called jajangmyeon. The sauce Korean used is not the same as Chinese, similar flavour but made with black beans called chungjang. Chinese zha jiang sauce is dark brown, salty, sweet and very fragrant. The main sauce ingredient for the sauce is sweet bean sauce (sweet flour sauce) 甜麵醬 and/or yellow bean sauce 黃醬. I like the sauce a bit spicy so I always add some chilli bean sauce (douban jiang) 豆瓣醬. The sauce mix is fried till caramelised in plenty of oil till fragrant. If you use only a little oil you won't get the same flavour. Other than meat, fried or marinated firm tofu can be added. Some people like to add shitake but not common. I really like Zha Jiang sauce a lot. It keeps really well in the fridge. A convenient sauce for quick noodles anytime of the day or night or when I don't feel like cooking. Heat oil till quite hot then add ginger, garlic and spring onion (or shallot). Stir for about 1 minutes then add sweet bean sauce, chilli bean sauce and dark soy. Stir fry and simmer the sauce for about 10 minutes or more till the oil has separated to the edge of the wok and the oil has become reddish brown colour. The sauce should now be very fragrant. Add meat and break any lumps. Keep stirring for few minutes till bubbly hot then add sugar and wine. Turn heat down and simmer for few more minutes, keep stirring sauce to prevent sticking. Cook sauce till thicken. If you don't like too much oil can skim after cooking. Use this fragrant oil for other cooking or use for Chinese noodles/ Sichuan salad to replace chilli oil. Finely shredded some cucumber and carrot. Can also use other vegetables like raw or lightly blanched bean sprouts, cabbage (white or red), blanched pak choi etc. Use dried or fresh wheat noodles. Cook as per instruction. For fresh homemade noodles try this recipe. To put the dish together, boil noodles. Put some in bowl, then top with vegetables and meat sauce. Zha jiang mian is my favorite.In Malaysia i can't find sweet bean sauce.Is there any substitute for this sauce? You can sub with ground yellow bean sauce/paste (toucheo) or hoi sin sauce, the flavour will be slightly different to sweet bean sauce. Toucheo or hoisin sauce can be very salty so use less try 1/3 cup first. I just have to let you know what a brilliant recipe this is. I have been drooling over your blog for a few weeks now and we had this today for lunch. I think it will be a new favourite. Thank you so much and keep up the good work!